Humiliation follows Aida Wilde wherever she goes. When her opportunity to prove herself at work goes awry, she’s certain her entire future is doomed. Wes Luedeke seems to have it all as CEO of his own company. But it can be lonely at the top. Can down on her luck Aida help Wes find his way to happiness? And will outgoing Wes teach Aida to own her embarrassing situations? I was hoping this would be a short, fun and romantic read and that’s exactly what this story was. 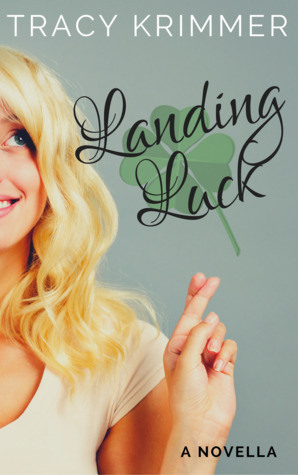 Landing Luck is about Aida who seems to have the worst luck, I really felt for her as she has this important presentation for her job and everything seems to go wrong in her day. She gets easily embarrassed and feels bad about all her bad luck situations. But somehow during it all she meets Wes and things turn around for her. I liked both characters, Aida was fun to read about and you really could feel her humiliation. It’s nice to see how she still tried to make the best of things even with her bad luck. I liked Wes even more, he has this brilliant outlook on life. To enjoy the moment, do what makes you happy and he isn’t easily embarrassed. I like characters like that and it was fun to see Aida get to know him and realize that sometimes there was no reason to be embarrassed, she learn how to let go at times. While the romance between Wes and Aida develops quickly I could feel their romance and it felt realistic. They just seemed good for each other and I liked how in this short novella they both changed a bit, realized things about themselves and even made some changes in a new direction. There’s a little bit of drama towards the end, but it was only a small bit and I am glad things got resolved easily without getting blown out of proportion. To summarize: I really enjoyed this novella! It’s a fun read and we get to know both characters a bit and see them fall in love. The romance does develop a bit quickly because of the shorter length, but their romance felt believable to me. I really felt bad for Aida her luck, she was fun to read about, but I liked Wes even more and his outlook on life. it was nice to see them both change a bit over the course of the book and I felt like they had a positive influence on each other. This book is the perfect read for when you’re in the mood for a short, fun and romantic read! Have you read any books focused on luck? This sounds light and fun even if she had a string of embarrassing circumstances. Wes does sound like a cutie and I like his philosophy of life too. I can go with a fast-moving romance if it is developed. I seem to recall I have read one or two books that had the luck element in them, but they were a while back before my reviewing days so I can’t remember the titles. One had to do with leprechauns, shamrocks, and the works. 🙂 The other was a person living with a curse like in a fairytale. It really made for a fun read and I liked Wes his philosophy on life. The fast moving romances worked here as it was well written. I vaguely remember I once read a luck focused box set where each character was in the same pub at some time in the evening, it was a fun set. I haven’t read many books about luck besides that so I was curious to hear if anyone else read a book with luck. Those two stories you mentioned do sound fun how they both deal with luck. A great review, Lola – thank you for sharing – I like the premise. The nearest series of books based around luck that I’ve read is the Alex Verus series by Benedict Jacka who can see a very short time into the future and uses this gift to avoid trouble by sifting through the possible timelines to avoid death and injury. It is an entertaining, well written series that isn’t as well known as it should, in my opinion. It was a fun read and the focus on luck was pretty fun. That series you mentioned sounds interesting and nice she can only see a short time into the future. I’m glad you enjoyed this one. It does look like it’s a fun novella. It’s always nice when a novella offers character growth and the chance to watch the characters fall in love. It just makes the book feel more realistic. I don’t think I’ve read a book centered around luck, although it does sound like something that would make a book more interesting. It’s nice when you find a novella like this where there is still some character growth and it feels realistic. It was a fun one. The luck theme was well done. I think this is one of the few books I read with luck as well. When I’m in the mood I really like novellas at times. I can’t remember if I’ve read a book about luck. If I have it’s been quite a while. You’re welcome! I am already looking forward to your next book! I’m glad this was a good read, especially being a novella. I like that the romance worked for you too! It was nice to read a novella with a well done romance. It was a fun read! I’m so glad you enjoyed this book, as I did too! I loved how Aida was constantly getting herself into trouble. Totally gave me chuckles. It was fun to see her get herself into trouble. And Wes was a nice contrast for her. Glad to hear you enjoyed this one too!